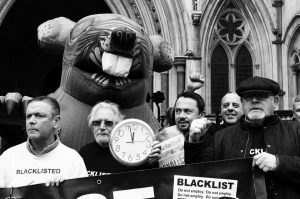 Blacklisted workers outside the Royal Courts of Justice. The Public Interest Law Centre represent Dave Nellist (former Labour MP), Hannah Sell and Lois Austin socialist and anti-racist campaigners in the Undercover Policing Inquiry. We also represent Youth against Racism in Europe (YRE) a major anti-racist/anti-fascist organisation in the 1990’s which was also infiltrated by undercover police. We also have several other activists and trade unionists whose case are currently under review. On 12 March 2015 the then Home Secretary, Theresa May, announced her intention to establish an Inquiry into undercover policing. On 16 July 2015 the Inquiry’s terms of reference were published. The Chairman delivered his opening remarks on 28 July 2015. The Inquiry was prompted following the reports in the UK media that in 2010 that a number of undercover police officers has created false identities, in order to infiltrate trade unions, political parties, and campaign groups. They formed deceitful relationships with women in these groups with and in some cases proposed marriage or fathered children with protesters who were unaware their partner was a police officer in a role as part of their official duties. Undercover officers, it has now been established, routinely had long-term, intimate relationships with women they were sent to spy on. More than one had children with them. It is now been established by activists in the group Spies out of Lives that the histories of the relationships were planned from wording love letters to the feigning of a ‘breakdown’ before ending and disappearing. The Special Demonstration Squad who particularly ran these activities was managed by officers who’d done it themselves. Undercover police officers spied upon family justice campaigns. Eighteen have been named, including those of Stephen Lawrence, Jean Charles de Menezes, Joy Gardner and Ricky Reel. The Inquiry needs to consider the resources that should have been deployed to catch the killers of Ricky Reel and Stephen Lawrence racist killers but were instead used to undermine the many family campaigns and the chance of justice. It is now established by the Independent Police Complaints Commission that Special Branch routinely and illegally supplied information on trade unionists from UCATT and Unite as well as political activists to the construction industry blacklist. The blacklist was organised by the Consulting Association. The list was compiled to assist the construction industry to keep trade unionists and those workers responsible for health and safety from obtaining employment. The Consulting Association held files on over 3,000 people when it was raided by the Information Commissioners Office in 2009. Many hadn’t worked in years. The Blacklist Support Group have consistently argued for a separate public inquiry into this scandal – something we think is overdue. It appears that on becoming an undercover officer it was often the case that an officer would steal the identity of a dead child. The officer would obtain a birth certificate of a dead child that had their first name. This would be the foundation to build a credible persona. In February 2013 the Home Affairs Select Committee report into undercover policing insisted that all families involved be told and receive ‘a full and unambiguous apology’. The police have identified more than 40 cases. Undercover political police spyed on elected representatives. Approximately 10 MPs have been identified and named as being spied on. This includes the current shadow Home Secretary Diane Abbott MP. Most of the MP’s were at one time members of the Campaign Group of Socialist MP’s – part of the Parliamentary Labour Party. This includes our client Dave Nellist. The Undercover Policing Inquiry is due to issue its finding in 2023.